Paul Vivas and Peter Magnaye during the awarding ceremony of the Swiss International Badminton Championship. 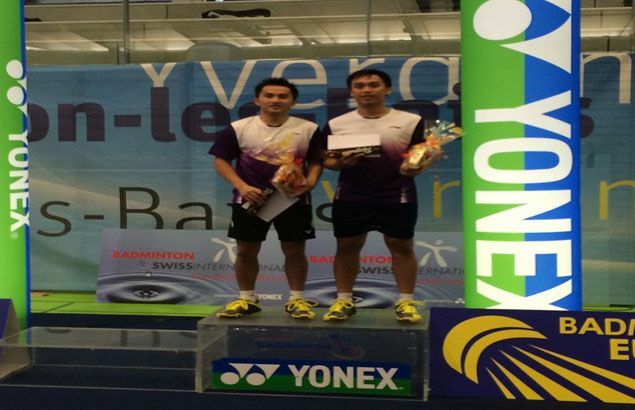 PETER Gabriel Magnaye and Paul Jefferson Vivas teamed up impressively in pocketing the men's doubles title of the Swiss International Badminton Championship 2014 at the Centre Sportif Arena in Yverdon-Les-Bains in Switzerland recently. The leading pair of PBA-Smash Pilipinas rallied back in the final two sets to outplay top seed French rivals Baptiste Careme and Ronan Labar, 6-11, 11-9, 10-11, 11-6, 11-10, to win the crown. "We did our best and the result was pretty amazing. It was really great to play for your country and win," said Vivas, who thanked national head coach Paulus Firman for guiding them to victory. "We didn't get tired despite the exhausting games," said Magnaye for his part. Other Filipino players who competed in the meet were Joper Escueta and Ronel Estanislao (men's doubles), Jessie Francisco and Eleanor Christine Inlayo (women's doubles), and Antonino Toby Gadi (men's singles). Escueta and Estanislao reached the quarterfinals but bowed to the pair of Careme and Labar, before Magnaye and Vivas avenged the loss of their compatriot when they beat the two top seeded players from France in the finals. Magnaye and Vivas, who are both member of Team Prima, were part of the seven-player team sent by the Philippine Badminton Association (PBA) in Switzerland to compete in the four-day tournament sanctioned by the Badminton World Federation (BWF). It was also the first time the Philippines won the Swiss Open International, one of the longest and prestigious European Open Circuit tournaments. "Moreover, beating one of the strongest powerhouse European country in the badminton world, France, is a great achievement, most specially in the open men's doubles where they are good at," said PBA-Smash Pilipinas Indonesian coach Paulus Firman. The eighth seed duo of Magnaye and Vivas, who recently won the country's Smart National men's doubles title, came out strong during the semifinals when it subdued German opponents Raphael Beck and Andreas Heinz, 8-11, 11-10, 11-7, 10-11, 11-4, to enter the final round. After winning their first two assignments in the elimination to reach the quarterfinals, Vivas and Magnaye sustained their impressive work by defeating Malaysians Alfred Leung Yu Lau and Adam Yu Ming Lau, 11-10, 11-6, 11-3, to reach the semifinals.